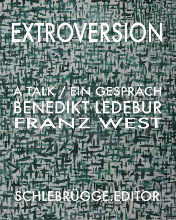 EXTROVERSION is published on the occasion of Franz West's participation in the exhibition ILLUMInations curated by Bice Curiger at the 54th Biennale di Venezia 2011. For this installation he transferred the kitchen from his studio in Vienna to Venice, turning the space inside out and creating a Parapavilion. The kitchen is the space where West keeps a collection of artworks realized by assistants, friends and colleagues (Michelangelo Pistoletto, Otto Mühl, Gelitin, Sarah Lucas, Urs Fischer, Jean-Marc Bustamante and others). The talk between Franz West and philosopher Benedikt Ledebur revolves around Wittgenstein and Heidegger, language and space, „the democracy of the ugly“ in art and the human need to philosophize.